We need sleep to make the most of our day, and this is especially true for children. However, sleep disordered breathing and other factors could lead to poor rest and prevent children from enjoying optimal quality of life. If your child has trouble with sleep, then consider talking to your Livonia, MI, dentist. With orthotropics, we may have a convenient and child friendly solution! Why Doesn’t My Child Sleep Well? Did you know that for some children, large tonsils and issues with the growth of the jaw or other oral structures could obstruct breathing? Known as sleep disordered breathing, this causes children to have trouble breathing and even stop for brief periods during the night. They may also suffer from acid reflux as the body lifts the diaphragm to try and create air passages. Without treatment, kids not only lose sleep, but may be more likely to develop sleep apnea as teens and adults. The impact on facial structure could mean weak chins, poor dental alignment, and other esthetic and oral health issues. How Do I Know If My Little One Needs Treatment? First, take note of how your child sleeps. Do you notice he or she often wakes up, has trouble going to sleep or waking up, and moves frequently, such as kicking, yelling, or tossing and turning? Have you noticed shallow breathing, snoring, or choking? These issues could mean obstructed breathing and poor rest. 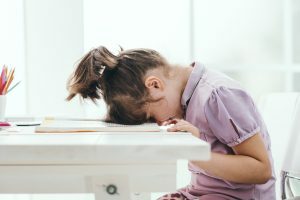 During the day, your little one is likely to also be moody, prone to tantrums, and may have trouble staying awake or paying attention in class. Some kids with sleep disorders are often misdiagnosed as having ADD or ADHD. How Will Orthotropics Improve Rest? First, we need to create open and clear air passages. With an orthotropic device, children wear an appliance very similar to a mouthguard. At night, the device repositions the jaw to open an airway. As your child grows and changes, this appliance guides the oral tissues and jaw, improving facial structure while also limiting the risk of sleep apnea later in life. Kids then enjoy a reduced risk of misalignment and may not need extensive orthodontic work in the future. We offer exams and treatments for children as young as age three. If your little one has trouble resting and is struggling with behavioral issues during the waking hours, please let us know. We can schedule a consultation and offer a diagnosis. We want to help your little one thrive! If you’re concerned about your child, then please schedule a consultation. James Stewart, DDS, and our team serve patients from Farmington Hills, Farmington, Plymouth, MI and the surrounding communities. To schedule a consultation, call our office today at (734) 425-4400.